After plugging in the TB15 to the 9550, I was able to power the 9550 from the TB15 over the Thunderbolt cable. So, this is a true one connection only docking solution. Which is pretty sweet. 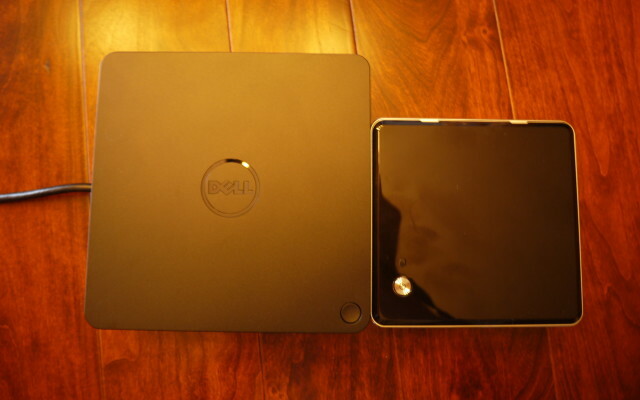 According to Dell, this is the case for all laptops that consume 130W or less. This seems a little conservative as this device came with a 240W brick, and there is no way it is going to consume 110W itself. Size wise, the TB15 is a little on the chunky side. 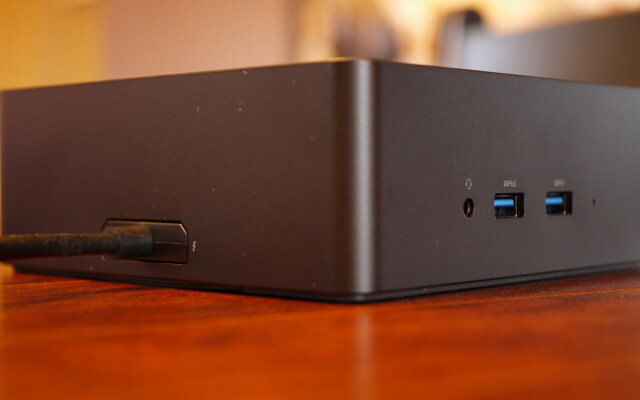 It is larger in every dimension in comparison to the Intel NUC5i3RYK. Even worse, the 240W power supply is gigantic. If there is a single reason to go with the 180W model it is for the smaller power brick. Also, there is the noise. Normally, when just plugged into the power adapter and idling the fan does not run. However, when plugged into the TB15, my 9550’s system fan never left the second to lowest spin rate. It was by far the loudest thing on my desk. Whether this is intentional, due to heat generated by the Thunderbolt controller, or some other side effect, it would be nice if it went away. The Thunderbolt cable is removable. However, it has a mounting bracket that requires two Phillips head screws to be removed. Without the 9550 plugged into it, the TB15 draws around 2.6W to 3.2W as measured at the wall by a Kill-A-Watt meter. With the XPS 15 9550 plugged in and idle on Windows 10 desktop the combined power consumption is around 28W as measured at the wall. So there is definitely an increase in power consumption for the convenience. As a final data point, the 45W, 130W, and 240W power adapters consume about 0W, after the initial surge current subsides, when not plugged into a device.